Someone had send about a dozen fresh organic broccoli and I have been cooking with broccoli a lot. Fresh organic vegetables make the best salads, the best grilled vegetables and even soups. Even though a soup is made by liquidizing a perfectly fresh vegetable, the taste tells the story of how much flavours it packs. I am definitely on a broccoli overdrive, not at all bored with this vegetable and was in fact really glad to encounter broccoli even when we went out for dinner the other day. 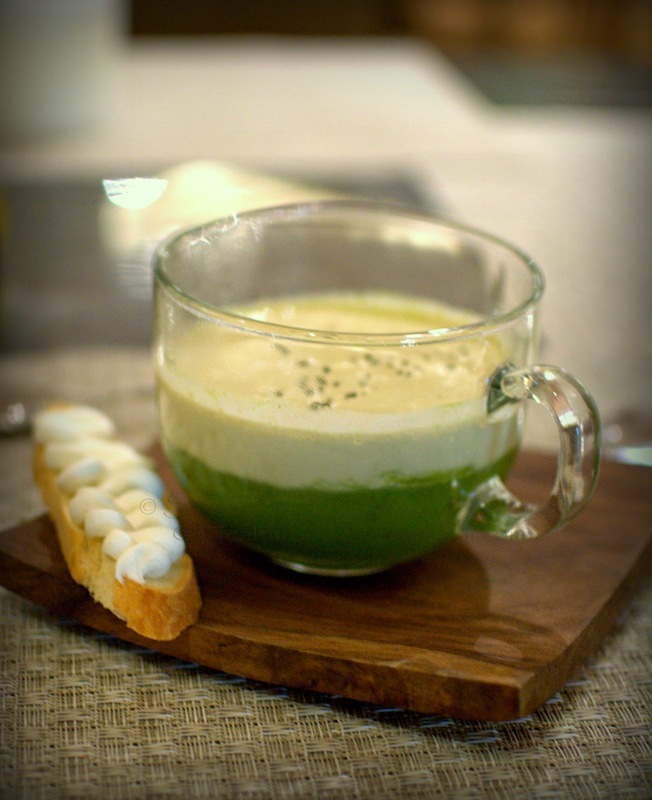 But this broccoli soup that I am referring to, was such a stunner that I have been dreaming of it since then. This was no ordinary broccoli soup, it was a broccoli cappuccino that piqued my interest instantly and kept the promise too. A green broccoli soup is topped with a dense foam of mushroom- walnut cream and is sprinkled with black olive dust. I polished off a huge mug of this soup and could have had more if I had not reminded myself to taste a few more things on the menu. 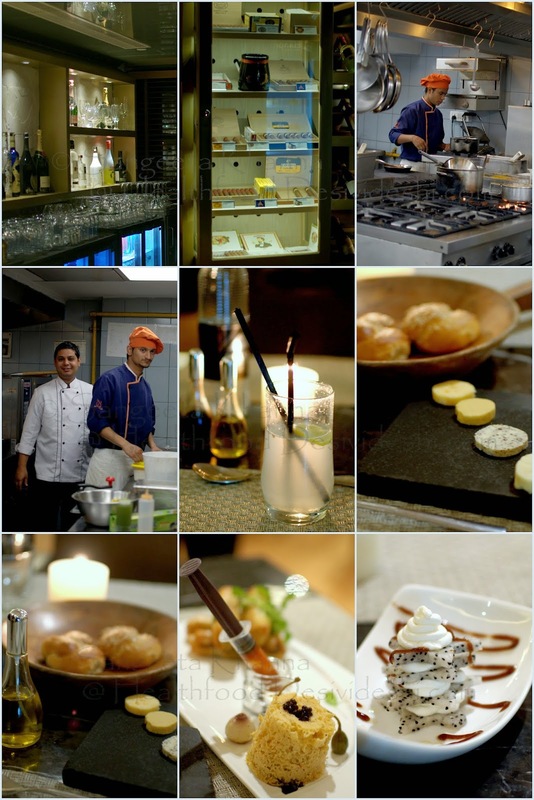 This was at The Hiatus, a voguish restaurant at Clarion Collection-Qutab Hotel. This restaurant has a nice patio, a private dine-in-cellar, a Chef's table inside the kitchen and a well stocked bar with a corner for cigar racks and additional seating. Quite a luxurious place with a promise of good food. Of course there were a few misses too but a few good finds in a dining place is good enough to remember the place and contemplate going back. I liked the assorted herb infused butter that came with the dinner rolls. House baked fresh breads and 4 different kinds of butters to experiment with. 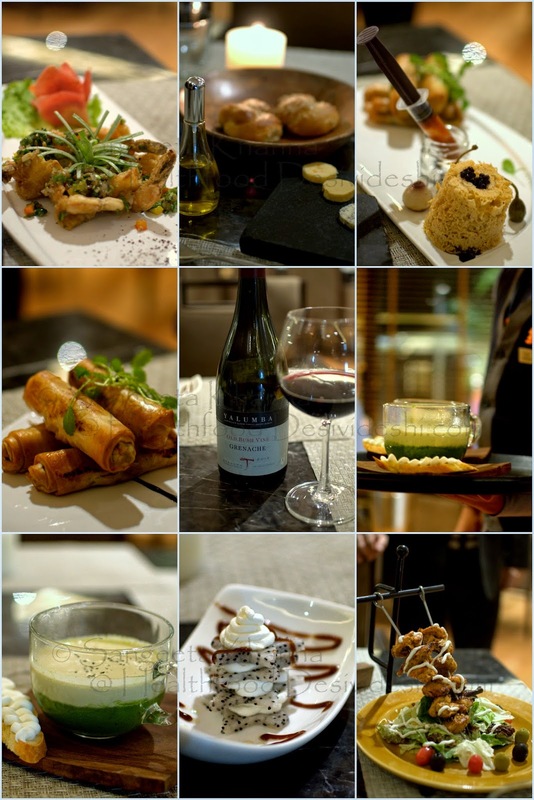 I liked the crispy fried prawns for starters but the mixed vegetable cigars were average. The presentation of the vegetable puff cigars was interesting with a huge syringe used to inject tomato sauce in a spongy bread topped with balsamic caviar. This was a case of more pomp less show but I like the idea of balsamic caviar using molecular techniques. We tried a mediocre tasting chicken tikka too that was pleasantly served with a good portion of green salad. I am not complaining, tikkas are mediocre food mostly. Amuse bouche was a layered stack of Dragon fruit and sour cream. Tasted more like a mini salad. What bowled me over again was a water melon salad that came in a natural bowl along with rocket leaves and different dressings, honey, olive oil and feta cheese on the side. 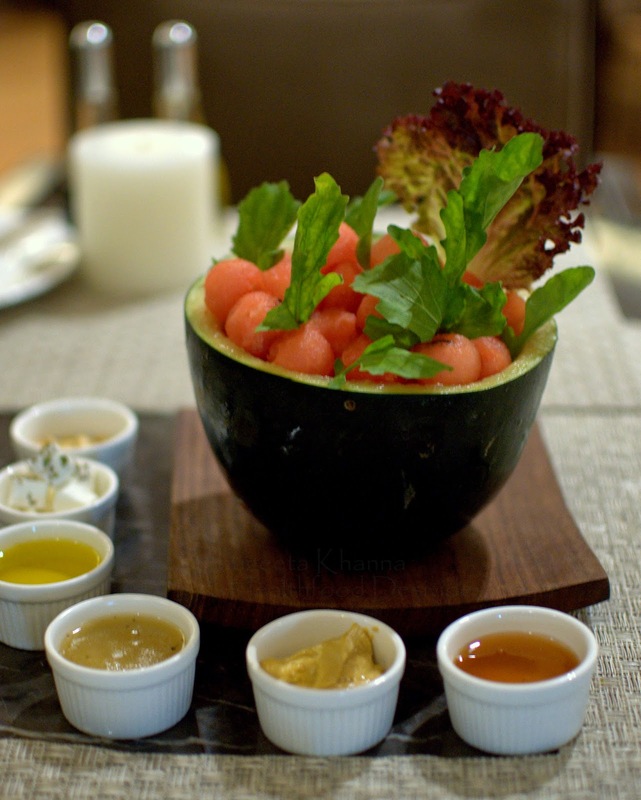 One can make a dressing one likes or just keep dipping the watermelon balls in different dressings and enjoying different flavours each time. For the first time I realised that watermelon tastes great with honey mustard dressing. This was another great find of the day. 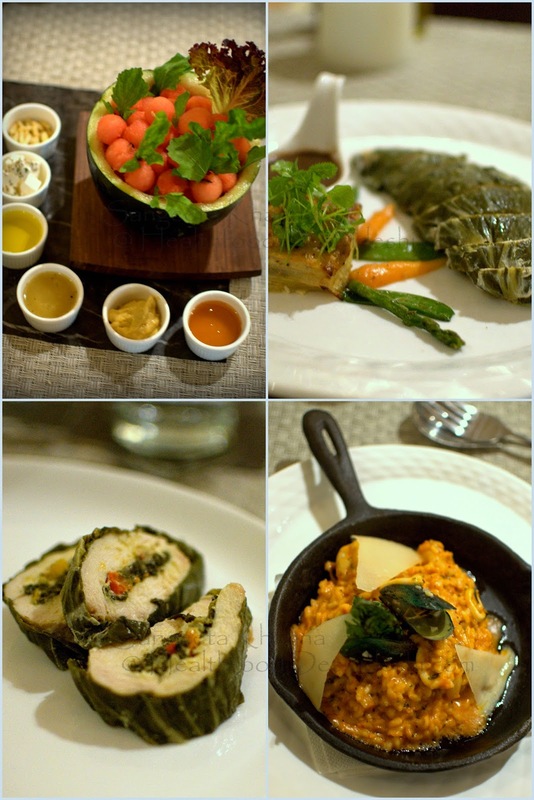 Among the mains, a slow steamed chicken breast rolled with spinach and herbs disappointed me as it lacked any flavours and the chicken was a bit too firm, although cooked in a Sous-vide machine they have. The seafood risotto was quite nice. Full of plump prawns and calamari rings and topped with a green lipped mussel, this risotto was truly a seafood treasure. A combination of mild pomodoro sauce and Parmesan cheese studded with seafood richness and deliciously cooked al dante, this risotto is something I would like to go back and eat again. I was not looking forward to the desserts but Arvind wanted to try. Nothing to talk about regarding desserts if you ask my opinion but the world going after red velvet cakes and flashy versions of tiramisu might find a few good things there. Most people like desserts just for the sugar rush it brings. I would be recreating the broccoli cappuccino really soon and share it here too. Stay tuned.